WASHINGTON (AP) — Heather Nauert, picked by President Donald Trump to be the next U.S. ambassador to the United Nations but never officially nominated, has withdrawn from consideration, the State Department said. WASHINGTON (AP) — A leading Republican senator on foreign policy issues says he doesn't yet know whether President Donald Trump's pick to be U.N. ambassador has the expertise and background to capably handle the job. President Donald Trump on Friday announced that he had chosen State Department spokeswoman Heather Nauert (NOW'-urt) to be the next U.S. ambassador to the United Nations. WASHINGTON (AP) — The State Department said Friday that it will continue to seek a full investigation into the slaying of U.S.-based Saudi writer Jamal Khashoggi as it marked International Day to End Impunity for Crimes Against Journalists. 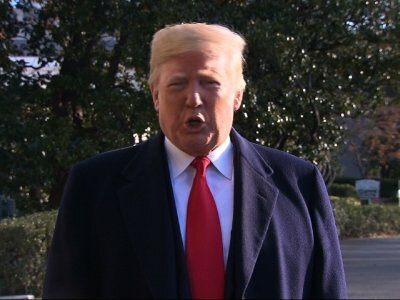 WASHINGTON (AP) — State Department spokeswoman Heather Nauert is among the people under consideration to be the next U.S. ambassador to the United Nations, President Donald Trump said Thursday. Trump said his administration will "probably make a decision" next week on a replacement for Nikki Haley, who announced in October that she would step down from her position at the U.N. at the end of this year. Nauert is "under very serious consideration," the president told reporters at the White House. WASHINGTON (AP) — An American pastor may soon be released after two years of captivity in Turkey. A person involved in efforts to free Andrew Brunson says the 50-year-old evangelical pastor from North Carolina could be freed at his next court appearance on Friday. The person spoke on condition of anonymity because officials had not yet reached a final agreement on the release and it could still fall through. WASHINGTON (AP) — A State Department spokeswoman says the U.S. is "gravely concerned" about the health of a dissident in Cuba who has reportedly been on a lengthy hunger strike to protest his imprisonment. Spokeswoman Heather Nauert says on Thursday U.S. officials have been told that Tomas Nunez Magdariaga (toh-MAHS' NOON'-yez mahg-dah-ree-AH'-gah) is in critical condition after being on hunger strike for more than 50 days. She called for his release, saying his "life hangs in the balance." WASHINGTON (AP) — U.S. Secretary of State Mike Pompeo is heading back to North Korea for another round of talks aimed at getting Kim Jong Un to give up nuclear weapons. State Department spokeswoman Heather Nauert told reporters on Tuesday that Pompeo will meet with Kim on Sunday, following a daylong visit to Japan. This will be Pompeo's fourth visit to North Korea since he became secretary of state. He made an earlier trip there, in April, when he was director of the CIA. WASHINGTON (AP) — The State Department says the death of an American diplomat in Madagascar is being investigated by U.S. and local authorities. 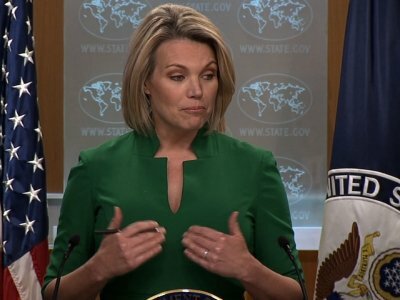 State Department spokeswoman Heather Nauert says the foreign service officer was found dead inside the officer's residence in the capital of the Indian Ocean nation off the East Coast of Africa. WASHINGTON (AP) — A Chinese military agency and its director are facing U.S. sanctions over the purchase of Russian weapons, the State Department announced Thursday. China's Equipment Development Department and director Li Shangfu made a "significant transaction" involving the purchase of Russian combat aircraft and surface-to-air missiles, State Department spokeswoman Heather Nauert said in a written statement. THE HAGUE, Netherlands (AP) — The U.S. State Department offered help Sunday to investigators in the Netherlands who are treating the stabbings of two American tourists at Amsterdam's main railway station as a possible extremist attack. State Department spokeswoman Heather Nauert said the U.S. was "ready to assist Dutch authorities in their investigations as appropriate." WASHINGTON (AP) — Secretary of State Mike Pompeo spoke Saturday with two Iraqi leaders to express support for Iraq's efforts to form a "moderate, nationalist" government that would serve all Iraqis, his spokeswoman said. WASHINGTON (AP) — Senior U.S. officials warned the Russian and Syrian governments Tuesday against chemical weapons use in Syria as forces allied with its President Bashar Assad prepare for an offensive on a rebel stronghold. The United States "will respond to any verified chemical weapons use in Idlib or elsewhere in Syria ... in a swift and appropriate manner," State Department spokeswoman Heather Nauert told reporters in Washington. WASHINGTON (AP) — The United States is ready for talks with North Korea when it's clear it will follow through on its commitment to denuclearize, the State Department said Tuesday after a planned visit to Pyongyang by top diplomat Mike Pompeo was shelved. BRUSSELS (AP) — The United States and the European Union said Tuesday that they are seeking details about the arrest of women's rights activists in Saudi Arabia, but they sidestepped a sensitive diplomatic dispute over the crackdown between the ultraconservative kingdom and Canada. The United States has commended "the courage of the Pakistani people, including many women" that turned out to vote in the country's general election. WASHINGTON (AP) — The State Department confirmed Thursday that another U.S. diplomat has been affected by mysterious health incidents in Cuba, bringing the total of Americans suffering from such ailments to 26. Spokeswoman Heather Nauert said the diplomat was "medically confirmed" to have experienced health effects similar to those reported by other members of the U.S. Havana diplomatic community. MANAGUA, Nicaragua (AP) — Nicaragua's Roman Catholic hierarchy has suspended a dialogue with the government aimed at ending a two-month political crisis. The Episcopal Conference of Nicaragua says the government has not met an agreed requirement to formally invite the United Nations High Commissioner for Human Rights and the European Union to observe the situation. It says government representatives said they had not been able to ready the invitations. MOSCOW (AP) — Russia's Foreign Minister Sergey Lavrov had a phone conversation with U.S. Secretary of State Mike Pompeo on Monday to discuss Syria, North Korea and plans for future U.S.-Russian contacts. WASHINGTON (AP) — The United States says it is "deeply concerned" by the arrest of a prominent Iranian human rights lawyer and is calling for her immediate release. Nasrin Sotoudeh, who had recently represented women protesting Iran's mandatory Islamic headscarf law, was taken from her home this week on unspecified security charges, according to her husband. She is also a critic of the judiciary, which is dominated by hard-liners, and has been jailed in the past. PANAMA CITY (AP) — Former Panamanian President Ricardo Martinelli returned home Monday to face political espionage and embezzlement charges after being extradited from the United States. The Foreign Ministry said U.S. officials turned Martinelli over at Panama City's international airport after a plane carrying him from Miami landed. ISLAMABAD (AP) — U.S. Secretary of State Mike Pompeo has spoken by phone with Pakistan's army chief to discuss political reconciliation in Afghanistan and other issues. 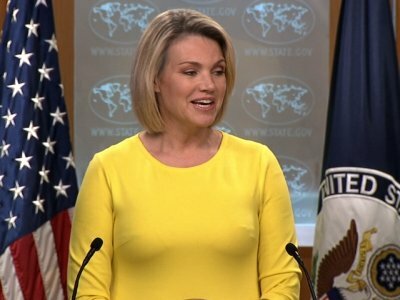 A statement released by State Department spokeswoman Heather Nauert says Pompeo and Gen. Qamar Javed Bajwa discussed ways to advance U.S.-Pakistani bilateral relations, the need for political reconciliation in Afghanistan and the importance of targeting all militant and terrorist groups in South Asia without distinction.